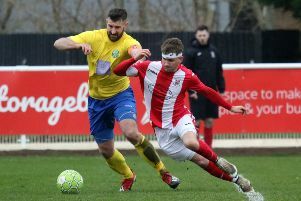 The working week will start easier for Banbury United supporters after seeing their side all but secure their Evo-Stik League South status. 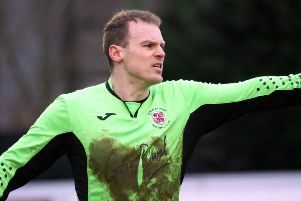 Without a win on the road since September, United finally picked up three premier division central points with a 3-0 win at St Neots Town on Saturday. Two goals from skipper Ricky Johnson and one from Northampton Town loanee Joe Iaciofano did the trick. The Puritans are now 12 points clear of the relegation zone with five games remaining. Charlie Hawtin returned after a month out through injury but Lee Henderson was still ruled out and Edmund Hottor suspended. United could not have got off to a better start by taking a sixth muinute lead. Greg Kaziboni made a typical run into the box to release Iaciofano who lobbed the advancing James Philip. Giorgio Rasulo had an effort ruled out, while Kaziboni and Iaciofano created several chances which went begging but Jack Harding had to be alert to keep out Scott Pollock’s free-kick. United finally doubled their advantage in stoppage-time when Kaziboni crossed for Johnson to head home from close range. The second half continued in the same vein as the first with United enjoying plenty of possession and St Neots stifled in midfield, reduced to hitting long balls which were easily dealt with by Charlie Wise and Harry Whitehead. Kaziboni, Johnson and Iaciofano all had chances before United wrapped things up in the 63rd minute. Iaciofano won possession on the left and advanced into the box before squaring the ball to Johnson who side-footed home from 15 yards. United were content to control the game and see it out for a welcome three points and their first clean sheet since the turn of the year.